There is nothing better than discovering that your property has a pleasant secret. 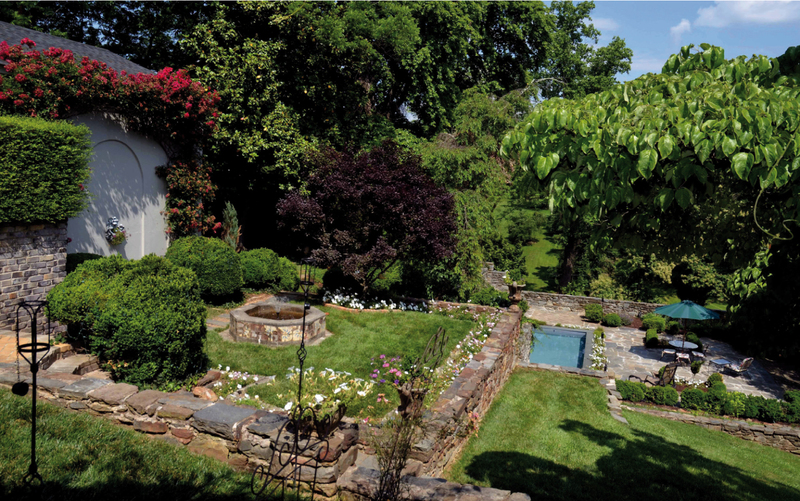 Hidden gardens, unique rooms, buried treasure—they add a sense of intrigue to a residence. When Martha Anne and Statham Gilliam purchased their home in 1999, they had no inkling of its history. But as time has gone by and they have worked to bring it back to its former glory, they have uncovered details that have made their Lynchburg property on Oakwood Place a real found treasure. Martha Anne calls the home an “English country style.” The elegant stucco residence was built sometime in the early 1900s, determined by recorded deed transfers, but the architect remains unknown. The first recorded owner of the property was Dexter Otey in 1914, who was an executive at a local shoe manufacturing plant. His wife Elizabeth Lewis Otey, highly educated with multiple advanced degrees, was remarkable in her work in the women’s rights movement. Following Dexter Otey’s death, Elizabeth moved to Washington, DC, and the home was sold at auction to settle a debt. Mrs. Charles (Paulina) Owen purchased it for $9,100. Since that time, at least four subsequent families held title before the Gilliams’ ownership. When the Gilliams first toured the house, Martha Anne liked it immediately. Statham says, “All I could see was work, but Martha Anne had the imagination to envision what it could be.” The bones were there; heart pine flooring, floor-to-ceiling windows, interior shutters, built-in bookcases, deep windowsills and wrought-iron balconies all added up to the perfect house for the Gilliams. Today, thanks to some fine craftsmen and the guidance of Martha Anne, the Gilliam home is a lovely tribute to their lives and lifestyle. It is designed to be both comfortable and elegant. Family, guests and their three beloved dogs all happily coexist here. A baby grand piano complements the large entry hall. Both Martha Anne and daughter Mary Pat are musically inclined and play the instrument. 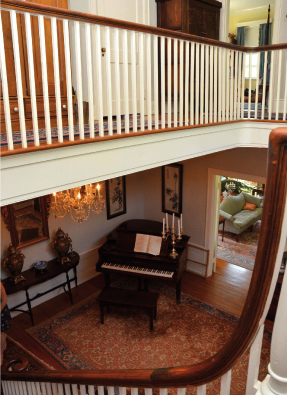 A staircase travels to an open second-story landing leading to additional bedrooms. This creates a two-story ceiling and the view from the downstairs hall is quite dramatic. Family pieces include furnishings and art from both sides of the family. At one time, Statham traveled to China for his work, and his family was in the furniture business, so interesting furniture came by way of both routes. Martha Anne adds, “My parents collected antiques. When they downsized, I got a lot of their things.” Pieces found at estate sales and antique shops fill in the gaps. Clearly the couple has a knack for design, knowing how to mix and match with ease. The living room is cozy and welcoming. Here, too, the room is brimming with family pieces. Mary Pat’s harp dominates one corner. It was restored by local craftsman Howard Bryant, who is nationally known for his restorations. The walls are dotted with art, including many paintings created by daughter Elizabeth who studied art and works in the Lynchburg schools as an art teacher. 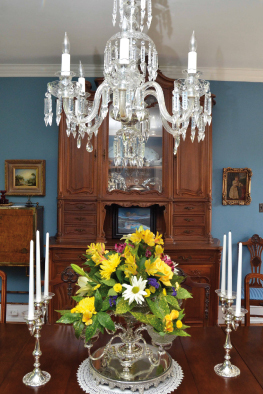 The 10-foot ceilings in the dining room were still not high enough for an enormous armoire from Martha Anne’s family. The top had to be reworked slightly to make it fit. A small china closet off the dining room is built into an area just below the staircase. This tiny alcove features built-in cabinets with leaded-glass windows, providing perfect storage for the family’s china. Furniture in the dining room represents many decorative styles and holds deep sentimental value for the family. Statham’s grandfather built the Sheraton-style side tables, which are actually part of a bigger set, matching a dining table that the Gilliams will eventually inherit. Currently Martha Anne’s grandmother’s Duncan Fief table serves as the main table. French blue draperies add elegance to the room, sewn by Martha Anne herself. The cozy den lures family and friends to come in and sit by the hearth. An antique corner cupboard is packed with silver trophies and the walls are lined with mounts collected when Statham was an active hunter. A genealogy chart noting Martha Anne’s family lineage hangs on a wall, tracing the family back to the first governor of Virginia. The kitchen was the most changed in their renovation efforts. According to Statham, “This is probably where we did more work than anywhere.” A staircase and small bath were torn out. Frances Gilliam Campbell, Statham’s sister, is a contractor and represents Design Directions in North Carolina. 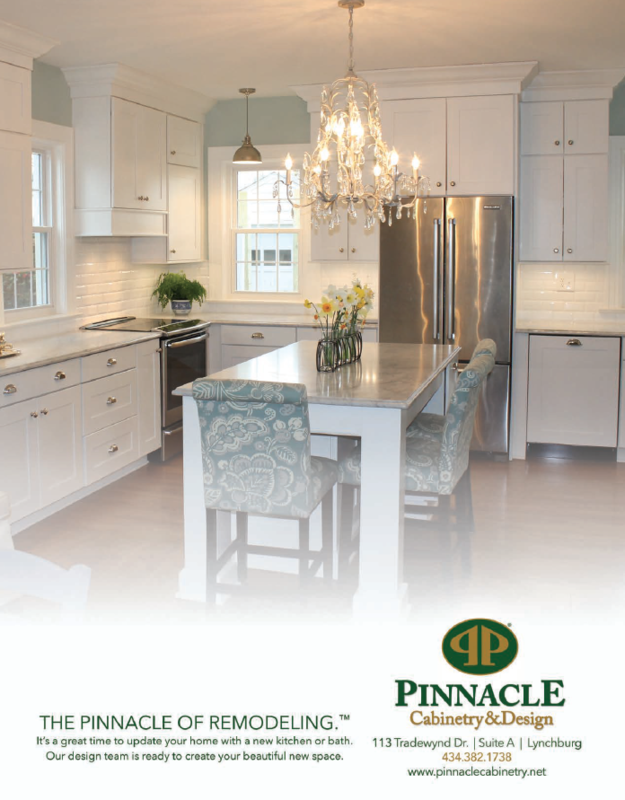 She designed the kitchen and the maple cabinets. Martha Anne recently installed unique iron cabinet pulls mimicking garden tools that perfectly complement the room. on every move, and today adds a bit of whimsy to a corner of the garden. A small back porch has the ambiance one might expect in a Southern home. Vines climb up the support columns and railings, and a porch swing beckons one to sit a spell. The porch steps drop to an enclosed and private courtyard. Here a wrought-iron table, chairs and potted plants create an ideal dining spot. The couple decided to begin a clean-up effort behind the house, enlisting an old friend and Statham’s co-worker Bernard Cabel to help. Bernard explains that as they collected debris, they hauled it back and dumped it behind an old wall where previous owners had created a dump site. Over the years, stumps and debris were piled high behind this stone wall. According to Bernard, one day when they were hauling debris to the back, they discovered some new rock formations. “The stone walls defined something, but behind them there was nothing to see,” says Statham. But then they found more rock, so they started to dig. As they cleaned out the area, they discovered some steps and remnants of a garden. These steps led down to a path of discovery that they never could have imagined. “One of our neighbors had lived here 40 years,” says Martha Anne. “And she knew nothing about this garden!” Because of all the debris and overgrown bushes, the garden beneath lay completely forgotten. Slowly but surely, they uncovered outlines of walls, leading them to more terraces and gardens. They found that water from a fountain on the first terrace dropped down to a pool. According to Statham, they could see some greenstone peeping out from the brush and weeds. It had become a favorite place for the deer to bed down. As the Gilliams pulled away the weeds and debris and cut away at overgrown boxwoods, elaborate tiles with a Spanish design on the walls and around the fountain appeared. Trellises, stone benches and planters were also uncovered. 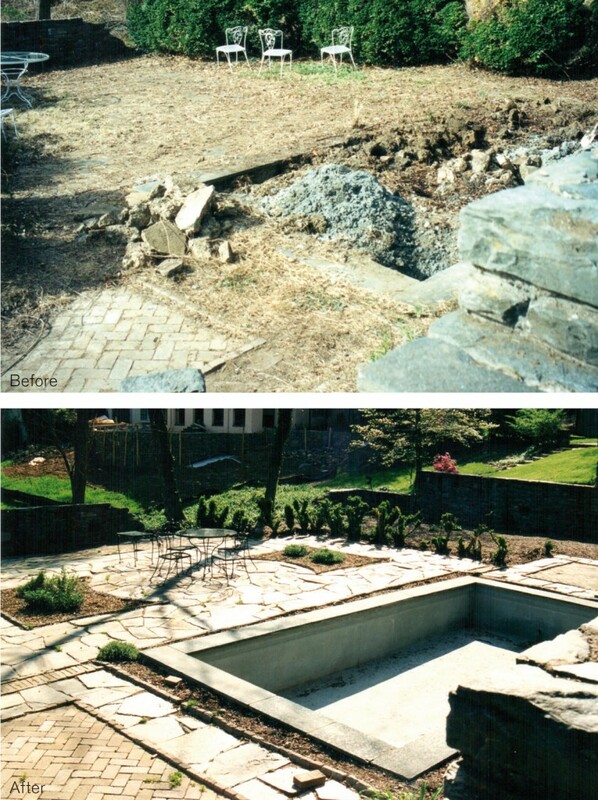 Over seven long years they worked to uncover the garden. According to Bernard Cabel, he came almost every day after work and on weekends when the weather was suitable to help with cleaning, clipping and digging, “It was a lot of hard work!” says Bernard. And because of the terracing and elaborate stone work, it all had to be done by hand. The transformation is incredible. To document their efforts both inside and out, Martha Anne had the foresight to take lots of photographs, which help illustrate the tremendous strides the couple has made since they moved to the home. The Mexican garden of Mrs. Charles Owen was the next stop. Here was a hillside garden done in a series of stone terraces (following the slope of the hill) for dining and lounging. A distinctly Spanish air was given to it by the plants in pots on the walls and a beautiful tiled fountain. The lowest and largest terrace with a pool and flower beds was a study in colors. Reflected in the ivy-enframed [sic] pool were orange day lilies. On the two corners near these lilies were pottery jars of deep robin’s egg blue. In the flower beds tulips shaded from yellow through soft red. Close to beds of forget-me-nots were benches, tables and chairs painted in shades of yellow and blue. While it may have been impossible to duplicate Mrs. Owen’s garden from the rubble that the Gilliams found, today roses climb the trellises, iron planters below the windowsills overflow with blossoms, and decorative urns are set about. 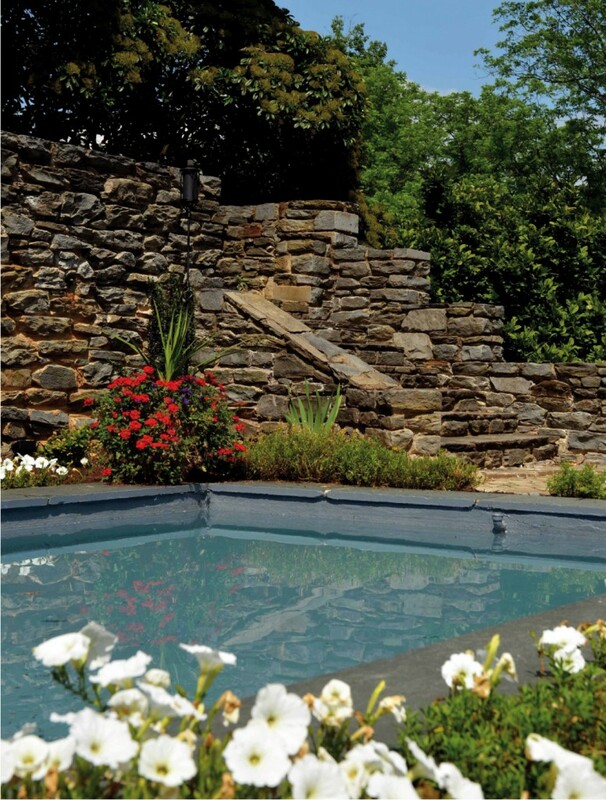 The greenstone-lined pool creates a lovely setting on one level. From here, water travels through a pipe in a wall, out an elaborate spigot, down into a spiraling drain, and into a goldfish pond. Then it flows down to lower terraces. This past May, the family celebrated the wedding of their daughter Elizabeth in the garden. “This is a great spot for parties,” says Statham. “It not only shows well, but there are neat areas to congregate.” Large shade trees dot the terraces, and beds of peonies and other perennials provide a cascade of color throughout the growing season. 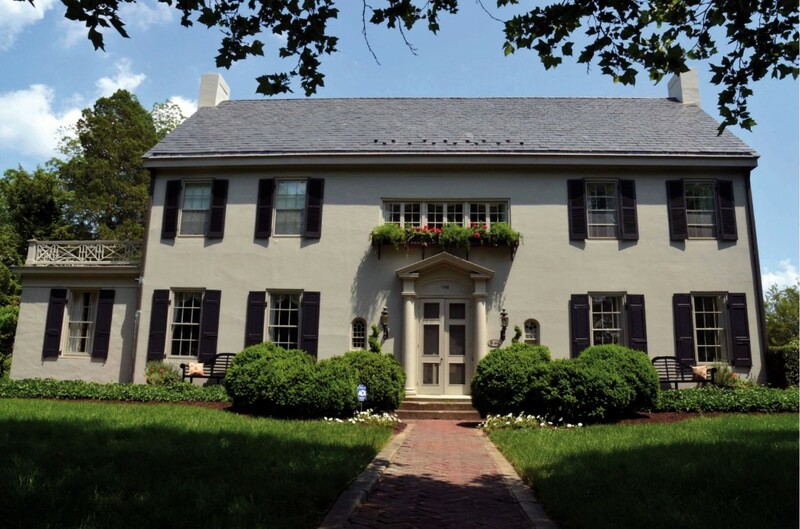 Thanks to Martha Anne and Statham Gilliam, the Lynchburg area can again include this home on Oakwood Place on its list of treasures.